South Korean technology major Samsung will build Galaxy Note 9 in India and will export to major global markets. Read to know the key features of the upcoming Android flagship phablet. Samsung's much-anticipated Android flagship Galaxy Note 9, which is slated to make the debut on August 9 is expected come with 'Made-in-India' tag. South Korea President Moon Jae-in and Indian Prime Minister Narendra Modi opened the doors of the Samsung's Noida plant. It is touted as the biggest mobile manufacturing unit in the world giving a massive boost to the central government's 'Make in India' initiative. Samsung confirmed that the factory will be manufacturing all mobile categories from low-end Galaxy J series to top-end Galaxy S9, S9+ and Galaxy Note8. This is part of Samsung's ambitious 'Make for the World' plan to project India as the global export hub for mobile manufacturing. 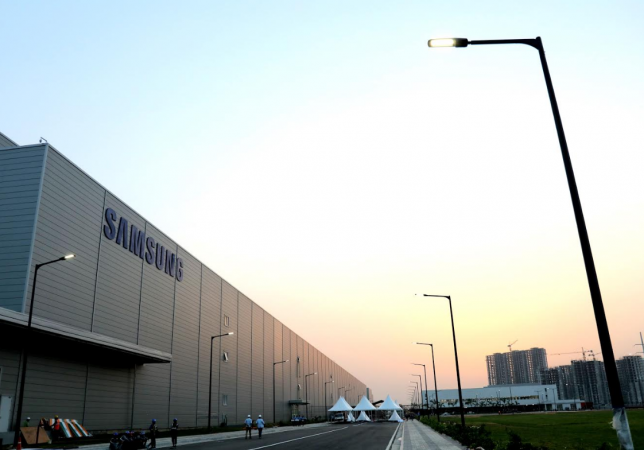 It can be noted that Samsung is first and a very few in the country to have set up factory units for Printed Circuit Boards (PCBs) right from its inception and is part of the Government of India's Phased Manufacturing Programme (PMP) plan. Previously, the company's old Noida plant was making around 6.8 crore phones out of which, only 10-per cent were exported. Now, with the addition of the adjoining new bigger manufacturing plant, spread over 1,29,000 square metres, Samsung will be manufacturing over 12 crore units, surplus enough to increase the quantum of export to Dubai, Eastern Europe, Africa, among other regions in addition to catering to the local market. It has now come to light that Samsung will also be soon starting the Galaxy Note 9 production at the Noida plant by the end of July and will start shipping to local and global markets around August-end. The Made-in-India Galaxy Note 9 is expected to come with the company's proprietary Exynos octa-core with 64GB storage (expandable up to 2TB) and 6GB RAM, reported The Times of India. It can be noted that Galaxy Note 9 will be coming with another chipset: Qualcomm Snapdragon 845 octa-core and will be bound for the US, China and South Korean markets and this particular model is unlikely to be manufactured in India, but in a different region. Rest assured both the Galaxy Note 9 variants will offer pretty same performance and long battery life. The soon-to-be-launched Galaxy Note 9 is said to sport a 6.4-inch Quad WHD super AMOLED screen with 18.5:9 aspect ratio and more than 85% screen-to-body ratio. The company has also enhanced the sunlight readability on device's super AMOLED display. Another much-needed improvement coming in the Galaxy Note 9 is that the fingerprint sensor has been shifted below the camera module for easy access to the finger and most importantly, it avoids users accidentally touching the camera lens. It was one of the major grievances in the Galaxy Note8, where it had biometric sensor right beside the camera lens. As far as the camera hardware is concerned, Samsung is also expected to incorporate improved ISOCELL technology for the Galaxy Note 9's camera, in addition to enhanced Optical Image Stabilisation (OIS) and variable aperture (F1.5-F2.4) to capture high-quality pictures in low-light. Another big improvement is that the company is upgrading the battery capacity to 4,000mah, 700mAh (21-percent) more than its predecessor, which will be enough to last a one and half day under mixed usage. Rumours are rife, that the Samsung Galaxy Note 9 base variant will be offered in 6GB RAM and 128GB storage. And for select markets, the company intends to retail 8GB RAM+256GB and 8GB RAM+512GB models, but later in the year. Stay tuned. Follow us @IBTimesIN_Tech on Twitter and on Google News for latest updates on Samsung.